Ted & Barry ask: Please bear with us as we join our lives together. Beartown, Pennsylvania – When Barry Ambrose was growing up as a young boy, he loved his stuffed black Teddy Bear. Unfortunately, that original Teddy Bear was suddenly lost when his family’s home went up in flames. That loss was almost more that Barry could bear. 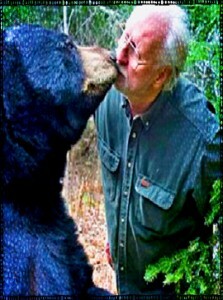 But his love of bears never left him over the years. As a grown man, Barry set out on a wilderness adventure loaded for bear. He was as hungry as a bear to find a grown-up replacement for his youthful friend. Now bear in mind, most folks are looking to get away from large black bears. But Barry Ambrose kept hoping that his search would eventually bear some fruit. One day, when he was just about to give up hope, he finally found what he was looking for. It was truly love at first bite. Barry and Ted met in an angelic open meadow full of colorful flowers and fluttering butterflies. After they greeted each other with a large bear hug, they continued to frolic in the forest for a fortnight. Not long after that, they were making plans to get married. Pastor Toni Thompson, who is going to be performing the wedding ceremony, said the two have a very special connection and their own way of communicating with one another. Even though many friends expressed reservations about a white man marrying a black bear, Barry said they decided to not just grin and bear it, but to smile and do it. After they were able to bear the brunt of much initial strong criticism from friends and family, they have plans for a large outdoor wedding, followed by a honeymoon in Yellowstone National Park. During the winter, they both will probably hibernate for a few months.